inflammation of the episclera and adjacent tissues. Inflammation of the episcleral connective tissue. /epi·scle·ri·tis/ (-sklĕ-ri´tis) inflammation of the episcleral and adjacent tissues. 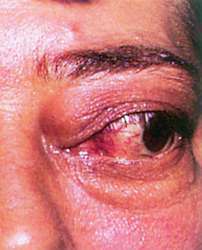 inflammation of the outermost layers of the sclera and the tissues overlying its posterior parts. A localized inflammation of the white of the eye (sclera). This is an uncommon cause of redness of the eye. The affected area is small, usually oval, and appears slightly raised and reddish-purple in colour. There is a dull, aching pain, worse at night, and intolerance to bright light (photophobia). The condition is treated with steroid eye drops. Inflammation of the episclera. It is a benign, self-limiting, frequently recurring condition that typically affects adults. The disease is characterized by redness (usually in one quadrant of the globe) and varying degrees of discomfort. There are two types of episcleritis: simple which is the most common and nodular which is localized to one area of the globe forming a nodule. Simple episcleritis usually subsides spontaneously within 1-2 weeks while the nodular type usually takes longer. If the discomfort is intense topical corticosteroids may be used (Fig. E4). See dellen; scleritis.